Food grade diatomaceous earth is a natural non-toxic method to kill bed bugs and prevent them from invading your home. Diatomaceous earth (DE) powder is a naturally forming substance that helps to get rid of bugs quickly and effectively. One of the benefits of using this white powder for killing bed bugs is that it won’t harm humans or pets. Bed bugs can be difficult to eradicate from your home and you can use diatomaceous earth together with other bed bug extermination methods to get rid of the critters for good. The abrasive action of diatomaceous earth powder destroys the bed bug’s exoskeletal system. The abrasion on the outer layer of these tiny pests causes them to dehydrate and very soon your bed bug problem will be gone for good. So, if you notice tiny black specks around your headboard, bedding, and in the corners of your mattress, you should think about using DE to kill off the infestation of bugs around your bed. 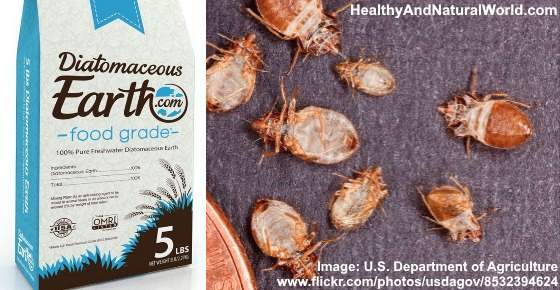 This article looks at how to use food grade diatomaceous earth as a natural pest control for bed bugs. You will also learn about bed bug infestation signs and when you should use DE or other bug control methods to eradicate the problem. First of all, let’s look at what diatomaceous earth is and why diatomaceous earth is effective for killing off groups of bed bugs and preventing them from infesting your home. Diatomaceous earth is a natural substance from the fossilized remains of diatoms – a type of algae. This is ground into a powder or dust to be used as a non-poisonous way to kill mites and insects. What Kind of Diatomaceous Earth to Use for Bed Bugs? Diatomaceous earth dust that you use to kill bed bugs should be classed as food grade (here is one example). The NPIC says that food grade DE has been purified and will not cause problems to humans and pets if ingested. Diatomaceous earth has been used as a non-toxic pesticide since the 1960s. The destructive action of DE on bed bugs causes them to die after a few days of exposure. Therefore, because diatomaceous earth uses “mechanical” action to destroy bed bugs and other insect pests, it can safely be used around the home to control a bug infestation. Diatomaceous earth can also be used as a natural ant repellent and help rid your home of cockroaches. In fact, food grade diatomaceous earth is safe enough to ingest and get rid of intestinal parasites. To use diatomaceous earth to kill off all bed bugs in your home, it’s important to know about the life cycle of the tiny bugs and spot signs of a bedbug infestation. The symptoms of being bitten by bed bugs are red itchy spots on your body. Dr. DerSarkissian says that the tiny bugs generally bite around the ankles, but will pierce any part of the skin to gorge on blood. The bites can turn into red bumps on your skin that cause mild to severe itching on the affected part of the body. Let’s look at the steps to use diatomaceous earth powder as a bed bug killer. This next section examines how to apply diatomaceous earth for bed bugs and what precautions you should take when using bed bug powders. The first step to completely eradicate bed bugs from your home is to find out where the annoying pests are hiding. You should vacuum all areas of your home that show any signs of bed bugs inhabiting the furniture or bedding. Check all holes and slots of beds and dismantle the bed frame if necessary. Check the seams of mattresses and pillows for bed bug feces and other signs of infestation. Look behind drawers, under chairs, behind pictures, and behind dressers and closets. Inspect behind the cover of electrical outlets. If you have recently returned from vacation, thoroughly inspect all luggage and clothing that you had with you. Before using DE for getting rid of bed bugs, you should encase any mattresses where you suspect bed bugs are hiding. For this, you can purchase specially designed bed bug encasements that will prevent the bug escaping from the mattress, pillows and other bed linen placed in it (here is one example). Because the bed bugs don’t have any source of blood, they will eventually die off and no longer become a problem. You should also wash your bedding in hot water and put in the dryer for at least 30 minutes to make sure that all bed bugs have been killed. You can also use hot steam as an effective home remedy to eradicate bed bugs and you can use it after vacuuming. The hot steam can eliminate bed bugs from small crevices and cracks. It can also penetrate through the mattress lining and eradicate bug infestations inside the mattress. Another thing that you may want to try is placing bed bug traps (such as this one) under your bed legs to stop bed bugs crawling up. The next step is to use food grade diatomaceous earth to kill the bed bugs from furniture, beds, and other hiding places where they live. Now is the time to put the bed bug killing power of food grade diatomaceous earth to work. This is what you should do to exterminate all traces of bed bugs from beds, sofas, and other furniture. Make sure that all areas are absolutely dry and free from moisture. Lightly dust all affected areas with diatomaceous earth powder. You can also dust over carpets, baseboards, pet’s bedding, pillows, and other soft furnishings. After 2 or 3 days, vacuum the area to get rid of any bug larvae, dead bed bugs, or eggs. Repeat the process of dusting diatomaceous earth powder on affected areas until all bed bugs are completely gone. It will take some vigilance on your part to completely exterminate all traces of bed bugs from your home. You should also remember to continue using diatomaceous earth for a week or so after you are sure that the bed bugs are gone. This is to ensure that you have no further infestation from eggs that may have hatched during that period. Although you can use food grade diatomaceous for bed bug killing liberally around the home without fear that it is toxic to humans and pets, there are some precautions you should take when using it. There are other natural ways to get rid of bed bugs that are non-toxic and safe to use in the home. You can make your own natural insecticidal spray by filling a spray bottle with water and adding 20 drops of tea tree oil. Shake well and apply to all parts of the bed where you think bed bugs are lurking. Just remember, not to spray onto areas treated with diatomaceous earth as the liquid will cause DE to become ineffective. Tea tree oil has another use in your battle with bed bugs and the irritation they cause. Tea tree oil contains antimicrobial and anti -inflammatory properties that can help to treat bed bug bites. All you need to do to reduce itching from insect bites is this: put a drop or two of tea tree oil on the end of a cotton bud and dab this on the itchy bed bug bumps as a spot treatment. Tea tree oil is one of the best natural treatments for bed bug bites as it kill off any germs that may cause infection. Use bed bug sprays. There are effective DIY and commercial bed bug sprays that contain natural ingredients. You can find out how to make and use these sprays in my article about the most effective bed bug sprays. Extreme temperature. Researchers from the New Jersey Agricultural Experiment Station recommend laundering bed linen in hot water and then drying them in a hot dryer to kill bed bugs. Also, you could put small items of bedding like sheets, pillows, and pillowcases in the freezer for 4 days. The best way to make sure that you never have any bed bug problem is to prevent these nasty critters from infesting your home in the first place. Here are some effective tips on how to prevent bed bug infestation. If you see dark marks or blood spots on your bedding, immediately check all areas of your bed, mattress, and bedding for signs of bed bugs. When staying in hotel rooms, use a flashlight to inspect the bed frame and mattress for signs of bed bugs. Before bringing in second-hand furniture, beds, or mattresses to your home, thoroughly examine the items to make sure there are no bed bugs in corners, joints, and seams. Vacuum your luggage after returning from vacation. For other ways to eliminate bed bugs for good, read my article about the top 10 home remedies to get rid of bed bugs. McGill. Diatomaceous earth – a non toxic pesticide. Insects. 2016 Dec; 7(4): 74. TAMU. Bed bugs – do it yourself control options. NCSU. Bed bugs – biology and control. Med Vet Entomol. 2014 Aug;28 Suppl 1:33-9. Most of this article is pretty accurate. However, there are some critical issues, which were missed. 1) Vacuum up some DE so that any critters going into the vacuum cleaner bag will encounter DE, in the bag. If this is not done, the vacuum cleaner bag will become a hiding spot for them. 2) Do NOT vacuum the infected area for at least a week and spray liberally onto carpet, in corners, into electrical outlets and any dark areas. 3) Put DE into strong glass or shiny plastic bowls and lower the legs of the bed into the bowls (One bowl for each let). Bed Bugs (BB) cannot climb anything it’s claws cannot penetrate. If one manages to get up the side of the bowl, it will fall into the DE, in the bowl. This way one can confine the BB to the Box Spring and mattress and makes for easier eradication. 4) Food Grade DE is quite expensive. One can buy General Purpose DE from a Garden Store. It’s about 10% of the cost of Food Grade and just as effective. You won’t even notice a difference. 5) BB can live for up to a year or more, without feeding. It is important to continue using DE for at least One Year. Do not vacuum it up unnecessarily. If you must vacuum then reapply the DE.